To cap off BFBN week, we wanted to highlight a Babywise mom blogger. 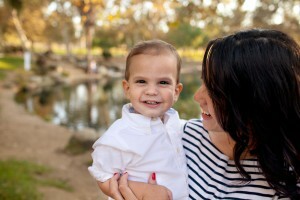 Today we are highlighting my friend Natalie from babysleeptrainer.com. Natalie is a sleep consultant and helps people through sleep training. Natalie has been a long-time blog reader. She has been reading almost as long as this blog has been around. A child’s personality has a lot to do with how quickly and easily the sleep training process will be. An easy going baby will take well to any type of method and either its regular or intermittent implementation. Generally speaking, the stronger willed the child, the more that child will benefit from extreme consistency on the parent’s part in implementing the training method. Read it, people. This is why some babies are easier to train than others. This is also why some parents are better at sleep training than others. This is why you can be inconsistent with one child and it can work out fine, only to find the slightest variation with your next child can create problems for days. I have had both kinds. Brayden and Brinley needed extreme consistency. Kaitlyn and McKenna were flexible. It is easier to go from the consistency child the flexible child rather than the reverse. I am, however, very similar to Brayden and Brinley so I very naturally am quite consistent and it was not hard for me to be super consistent with Brinley after two flexible babies. And it should be said, while flexible babies can roll with changes, they still do far better with consistency. Always err on the side of consistency. Dear Valerie,I'm so grateful I found your blog!!! I'm a FTM and my baby is currently 6 weeks 3 days old and weight 12 pounds 9 ounces. Even though i started him off on a baby whisperer pattern from about 2 weeks old, my husband and myself fell into letting him sleep on our chests at night when he cried till it started to become uncomfortable at 4 weeks. Now we've read babywise, been more consistent with his schedule and have decided to do CIO to help him sleep better and sleep in his own moses basket. I'm doing it at every nap and at bedtime. It's been hard doing CIO especially because my dad has come to visit so I've had to let him be held to sleep because he wants to cuddle the baby and also because they don't approve of CIO. Based on your experience with Brayden would you suggest that I stop CIO completely until I can implement it only when I can do it for every sleep time? Also at some naps he cries himself to sleep, wakes up after about 10 minutes cries again and can do that for about an hour. Yesterday after 5 minute naps twice he cried for 40 minutes at which point i picked him up fed him and let him sleep on my chest. Third question on the first night of CIO he actually slept his first 7 hours from 10.30 till 5am (i gave him a "dreamfeed" at about 3am because I didn't want him to be hungry but he never woke up. However the next 2 nights he slept about 4 hours, was fed and then started to wake every 2 hours. What can I do to help him sleep better more consistently. I feel like he's eating well at his 10.30pm dream feed and throughout the day so I don't know what to do. Thank you so much for taking all the time to provide the information and detail you do. It is so so encouraging especially when you come from a culture where babies are rarely not held and people don't like them to cry ever. I would wait for consistency before doing CIO–at least 90-95% consistency. How long is he up before you put him back down? At his age, 40-60 minutes is what babies usually do, and that includes feeding time. Getting your self soothing down in the day should help night follow. Valerie – FTM here. Desperate as well! my daughter Nora is 7 weeks old and is a terrible napper. She went through a phase at night time too where it was impossible to get her to lay down and we started ferberization with periodic checks and it resolved it self within a few days. not sure if this is luck or again if she was just going through a short phase. however, her three daytime naps all result in her wanting to be held, usually by me. i have a routine, her nursery is dark and cozy, and she is swaddled. I also implement tracy hogg's method of sitting which seems to get her very relaxed. regardless, if i put her down drowsy or deep sleep, she wakes up. i tried CIO for one nap a day with periodic checks and she cried for over an hour an 15 minutes so no success. i would try for more naps but then she is fussy at the bottle with no sleep at all. usually, after i pick her up after the hour and 15 minutes she is calm and pretty much half sleeping on me within a minute. most times, when i go in to check, it seems my going in on her just makes her more mad. what do i do? she will gladly sleep on me for an hour and half during the day but i can not be bound to a chair for 8 to 9 hours and my maternity leave is ending soon. do you feel she has a personality similar to brayden and perhaps i should not check on her at all while she cries it out? i feel i have tried everything – routine, baby whisperer with the ssshh-pat, all to no avail. i feel nora is unlike most other 7 weeks old in the fact she came out of my womb eyes wide open and neck flailing about. i know she can put herself back to sleep, seeing as she does it for her long morning nap and most times at night. pediatrician's head nurse said an hour and 15 minutes of crying is too much for her and that she wants comforting. I know that otherwise i would not be in this situation! any suggestions or advice you have would be greatly appreciated, i am desperate. i am sitting here typing as she cries 🙁 Thanks! Thank you Valerie, I value your advice and i wanted to give you an update. So everyone has left our house and I've been consistent with his schedule for the past week. Its typically 6.30-7am wake time, then 9.30am, 12.30pm, 3pm, 5.30pm and 8pm then a dream feed between 10.15-11.30pm (when I sleep off and don't set an alarm which was twice this week). He prefers to do 2.5 hours between meals but can do 1 or two 3 hour gaps during the day.Naps are still not going very well. Today is a typical example. Did his nap routine 52 minutes after he had been awake. It ends with me holding him standing (sitting isn't comfortable) and patting him till he's calm and drowsy. I put him in his bassinet at 8.08am awake but drowsy. He started to cry at 8.16am for about 14 minutes then slept for 13 minutes. cried some more and slept between 9am and 9.21 at which time i got him up and fed him.Because he was tired, i had in him in bed drowsy for his next nap 40 minutes after he was awake. (based on bayberries and your post on shortening wake times as a solution) He's cried 23 minutes, slept for 32 minutes. I went in, picked him up and calmed him down, patted him and put him in bed drowsy and he's crying again. Usually i leave him to CIO till the next nap, but i decided to try something different to preserve his sleep.The day usually goes like this and then maybe for his 3pm nap, he'll sleep for an hour and a bit because he's exhausted. I don't really know what else to do and I'm sorry for bothering you with so much detail, but I'm at my wits end!I read somewhere that babies don't have the biological ability to self soothe till 3 months. Is this why he can't seem to sleep an hours stretch? HE's such a happy boy when he sleeps, but getting him to sleep enough in his crib is nerve wracking. I can barely focus on my school work listening to him cry. I look forward to your suggestions!Thank you so much.